Whilst the Glencoe area is often associated more with adrenalin sports than the more sedate pastime of golf, there’s still plenty of opportunity to play a round on a choice of golf courses. 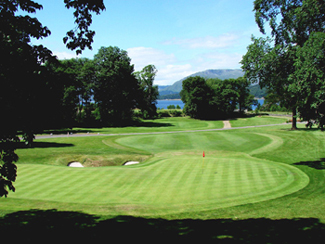 The golf courses themselves are located in stunning locations amidst the scenery of the West Highlands of Scotland. The closest golf course is the Dragon’s Tooth Golf Course at Ballachulish, adjacent to the Ballachulish Hotel and the unmissable Ballachulish Bridge. The view from the fairways at this 18 hole golf course takes some beating. Visitors are always welcome. Non-golfers can relax at the Club House where food and drinks are available, and perhaps make use of free wi-fi. The Dragon’s Tooth is also a centre for a number of other Glencoe Activities, such as segways and archery. Alternatively, hire a bike and head along the Sustrans Cycle Track which passes to the rear of the course. You can also visit the more established 18 hole course at Fort William under the imposing north face of Ben Nevis. Further along the Inverness road to the north you can try the 9 hole course at Spean Bridge. Traigh Golf Course, located between Arisaig and Mallaig on the West Coast of Scotland, is the course that really does beat the views from the Dragon’s Tooth. White sand beaches, emerald seas and the Cuillins of Rum and Skye are a real distraction on this 9 hole course. Combine a trip out west with a round on this stunning little course! If you want to combine your golf with a day trip to Oban then you need to head for Glencruitten Golf Club, which is a lovely course just to the east of the town.